This pizza with arugula pesto is basically summer on a perfectly grilled pizza. It’s sweet, salty, tangy, chewy, crunchy, subtly spicy (thanks, arugula! ), and topped with creamy cheese. It’s everything you need in your life. I am so excited to share this recipe with you guys. 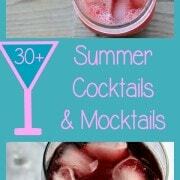 Don’t let summer end without trying this one. I teased you a bit with the arugula pesto, and I’m finally delivering the pizza, so to speak. First, a story. Grilling pizza can be tough. Sometimes, you’re confident and self-assured, even though your husband normally does the grilling. You fire up the grill and it turns on and actually begins to get hot. Then you take your carefully prepared pizza dough (or store-bought, whatever), stretch it into a perfectly-round circle (or something not even resembling a circle), and place it on a tray to bring outside. Now all you have to do is transfer that sticky, stretchy, pizza dough onto the grill. Easy, right? This did not go well for me the first time. I ended up with a lump of tangled-up dough not even resembling anything close to a pizza. It looked more like a funnel cake, if we’re being honest. I grilled it for a little longer just for fun and then pulled it off and snacked on it. Back to the drawing board. And the grocery store. 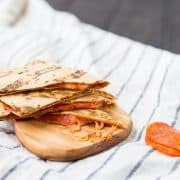 I don’t have a pizza peel but if you have one, it’s going to come in super handy for this recipe. So would a pizza stone (check out the video towards the end of this post to see one in use!). My kitchen is what I’d call overly stocked so I’m not quite sure why those things were missing. For the first successful run of this recipe, I ended up using a wire mesh disposable grilling “pan.” It was like this one, except round. It worked like an absolute charm. Now, I still want to get to the point where I can just toss a beautiful round ball of dough on the grill and have it turn out perfectly, but in the meantime, I’ll take all the help I can get. PS: I grilled this other grilled pizza with ricotta without a pan, peel, or stone, but Ben was home to help me get the dough onto the grates of the grill. Maybe the secret is that it’s a two-person job. That pizza also didn’t turn out the prettiest, but we’re getting there. Slowly. Let me tell you why I love this pizza so much. The arugula pesto gives it a major head-start into delicious town. 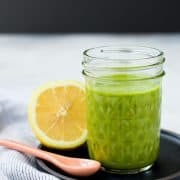 It’s subtly spicy, bright from lemon, and packing a small punch of garlic. It’s a great base of flavor for this summery pizza. Next come the dollops of creamy ricotta. It adds a saltiness and also makes this pizza filling and satisfying. Next comes beautiful fresh sweet corn, cut from the cob. This adds a beautiful sweetness and gentle crunch. Red onions add gorgeous color and their signature flavor. The final touch is salty ham, but prosciutto or crisp bacon or pancetta would also be fantastic. A sprinkle of freshly grated Parmesan brings everything together. This pizza with arugula pesto is even great leftover! 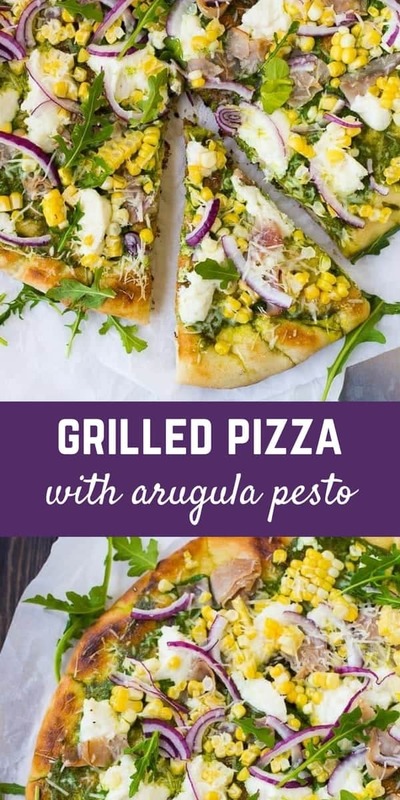 Hit play on the video below to see step by step directions for making this pizza with arugula pesto! Preheat grill to medium heat (350-400 degrees Fahrenheit). Flour pizza dough lightly and stretch or roll pizza to about 1/2 inch thickness (14-16 inch diameter). Sprinkle flour or cornmeal on a large unrimmed baking sheet or pizza peel. Transfer the pizza dough to the baking sheet or peel. Brush grill grate to clean it and oil it with an oil soaked paper towel and tongs (alternatively, you may use a pizza stone placed on top of the grill). Slide the dough off the baking sheet or peel onto the grill and cover and cook until it is bubbling on top and golden brown on the bottom, 2 to 3 minutes. Carefully flip the dough over using the peel or tongs and baking sheet. If desired, pull it off the grill while you add toppings. Spread the pesto over the dough. Top with small dollops of ricotta, and the rest of the toppings. Cover the grill and cook until the toppings are heated through and the bottom of the crust is crispy, 5 to 7 minutes. Remove from grill, slice and serve immediately. Verdict: You can probably already tell I love this pizza. Husband’s take: Ben picked off the onions, but other than that he loved it! Of course, my guy always prefers pepperoni and cheese, but he’s married to a food blogger. Difficulty: Moderate. Easy once you get the dough on the grill…. Disclosure: I have been compensated by Milk Means More for my time to develop this pizza with arugula pesto recipe and write this post. All opinions are as always, my own. Find out more about why Milk Means More on Twitter, Facebook, YouTube, Instagram and Pinterest. Grilling pizza can be so tricky – love how crispy you got the edges! It really can be! I had my struggles at first. :) Thanks! Yum! I love all of these great toppings. 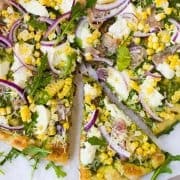 I had corn on a pizza once in Turkey-it was FABULOUS! Beautiful pizza, and bursting with flavor! Fresh corn is a must this time of year! LOVE this pizza! !